Glass windows that are poorly insulated are a leading cause of energy loss in a typical home. When it is cold outside, the heated air inside your home can radiate through the glass to the outside, making your furnace or boiler “kick in” more often. At the same time, chilly outside air can “leak” into your home through an ordinary glass pane – even if they are dual pane windows. During the hot, humid summer months, cool, conditioned air can escape while warm air infiltrates. That’s what makes Renewal by Andersen’s High Performance™ Low-E4 glass such an important part of your new windows’ energy efficiency. With our High Performance™ Low-E4 installed, your windows become an effective barrier against thermal conductivity and energy loss. Low-E glass is a way to control the heat being allowed into and out of your home. Low-E is a specially coated glass that allows light to pass through, but controls the “emissivity” of heat energy. Emissivity is a measurement of how readily a material radiates absorbed energy. The lower the emissivity value, the more energy efficient the material. By blocking heat-generating ultraviolet light and reflecting heat back to its source, the High Performance™ Low-E4 glass in our Renewal by Andersen windows mean you’ll need less heating or air conditioning to keep your home at a comfortable temperature. High Performance™ Low-E4 makes our windows some of the most energy efficient windows in St. Louis homes. 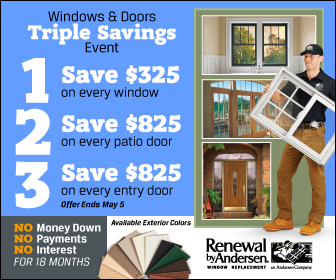 *Values are based on comparison of Renewal by Andersen double-hung inserted window SHGC to the SHGC for clear dual pane glass non-metal frame default values from the 2006 and 2009 International Energy Conservation Code.